"Everyone is guilty until proven innocent - and even then he's guilty!" 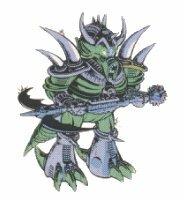 Profile: As cruel as a weasel toying with its prey and as persistent as a bloodhound on the trail of a fugitive, the Quintessons are the merciless enforcers of Unicron's will. They hunt down those who try to escape Unicron's wrath. Once the victim is captured, he is doomed. Guilty or innocent, the verdict is always the same - death. 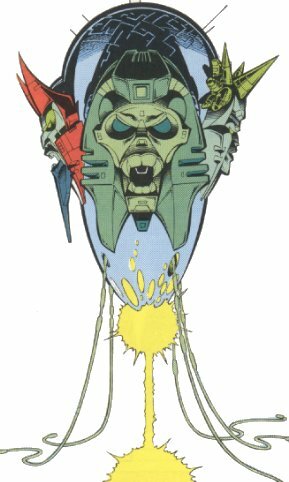 The Quintessons are composed of Guards, Gatekeepers, and one five-headed Judge. The Quintessons are the cruel masters of the endless legions of Sharkticons which carry out the Quintessons' verdict. 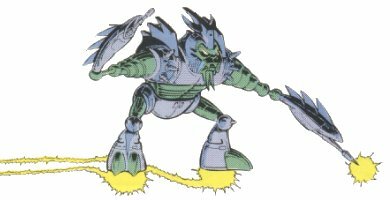 Weaknesses: The Quintessons are few in number compared to the Sharkticons, and deathly afraid of them, for if the Sharkticons should revolt, there is nothing the Quintessons could do to stop them.